baseball team is finally on a roll. "time by a score of 7-4.
to become an easy win. Wysocki was critical to that,"
Kevin White has started four games since starter Jacksos Lamb injured his back. to get back in the game." "We just talked to the team,"
let a rain delay lull you to sleep. guy at the beginning of the year,"
he can do over a consistent period." home run of the season to left field. ting the elements beyond his grasp. tribute to the team," White said. the first time in 80 years. count was 13,949 to 5,783.
in the city of Ypsilanti. 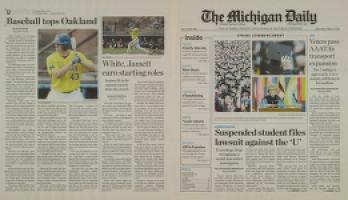 man delivered her final commencement speech at Michigan Stadium.